This is a list of resources for you if you want to learn to sail, to rent a boat, to buy a boat or (it happens) repair a boat in the Phoenix area. The people who run these businesses are all members of the Arizona Yacht Club and we appreciate their support. You can spot a Tiller and Kites boat by the, mmmm, distinctive color. If you want to learn to sail, we naturally recommend that you start with the Learn to Sail class from the nonprofit Arizona Sailing Foundation, taught by US Sailing certified instructors and coaches from AYC. The class includes the Little Red Book that leads to small boat certification from US Sailing. Two of the following for-profit schools will certify you through the American Sailing Association (ASA), which is a cruising-oriented certification organization. The third, Tiller and Kites, issues certificates from International Yacht Training, an organization more known in Europe than in the U.S. When charter companies require sailing certification (and it happens only sometimes), they will accept courses from US Sailing, ASA, or IYT. Go Sail Arizona is based at Pleasant Harbor Marina, offering ASA 101 and sailboat rentals. “Captain Clint” also offers more advanced ASA training with courses on the West Coast. Go Sail Arizona also rents Capri 22 sailboats. The Sailboat Shop has served Arizona sailors for three decades. Tom Errickson is now operating from Scorpion Bay Marina and offers several ASA-certified sailing courses. The Sailboat Shop also rents various sailboats, sells boats, and repairs boats. 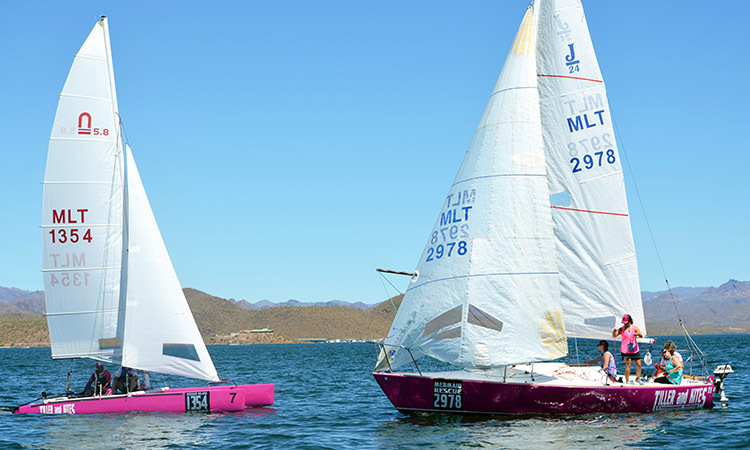 Tiller and Kites is an International Yacht Training sailing school based at Lake Pleasant with a diverse fleet of boats, including Laser, Coronado 15, Santana 20, J/24, Nacra catamarans and Catalina 25. Tiller and Kites’ sister company, Tumbleweed Sailing, offers a shared-ownership option on Catalina 25 fin keel boats. And T&K also rents, repairs and sells boats. Desert Wind Sailboats focuses on dinghies, selling Lasers and Optis and others and offers parts, accessories, and clothing. We also count on two companies to take care of the AYC and ASF powerboat fleet, five boats that absolutely must run properly. They’re Glendale Marine with Steve Nahkala and Valley Marine with Gene Walentiny.